My trip to the Farmers' Market on Saturday was quite fruitful. In addition to my weekly bunch of organic red lettuce, tomatoes and corn I bought some Georgia peaches (I know they aren't local, but there don't seem to be any Kentucky peaches,) the most perfect eggplant, some sweet onions, and a ton of peppers. Peppers were really out in abundance so I stocked up on sweet banana peppers and jalapeno peppers. I don't actually eat straight jalapeno peppers, but there is an unopened container of Tofutti cream cheese in my refrigerator with no purpose and this seemed like a great excuse to veganize jalapeno poppers. The man at the Farmers' market recommended using a beer batter (1 part beer, 1 part flour, salt and pepper to taste) and then fry the poppers. We didn't have any beer in the house so I decided to try a baked version instead. Preheat the oven to 300 degrees and grease a 9x13 pan. Mix together the cream cheese, taco seasoning, and bacon pieces until completely smooth and set aside. Next, wearing gloves or plastic wrap, cut the jalapeno peppers in half lengthwise and remove the seeds. Score the outside surface of each pepper half. Spoon the cream cheese mixture into each of the pepper halves. Dip each pepper half in soymilk and roll in flour. Set aside. After all of the pepper halves are floured, add the oil to the soymilk. 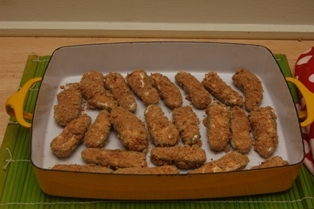 Dip the floured peppers in the soymilk mixture, roll in bread crumbs and place on greased pan. Bake for 30-45 minutes. The longer you cook them, the milder the peppers come out. This recipe was a variation of the recipe found here. oh my -- sooo good! If not, I'll be sure to always look for you here! dude - I'm drooling . . and I just ate! egads those look good! i have to try that recipe myself ASAP!